There are cameras that just take great pictures. And then there’s the new Cyber-shot T300 from Sony. Available in a choice of couture silver, black and red finishes, the T300 stands apart from other cameras with its svelte lines and audacious vertical-format styling. Looks apart, it’s a powerhouse of advanced Sony technology that makes it easy to shoot and share breathtaking images. Picture quality and responsiveness is assured by the high-speed Sony BIONZ image processing engine that improves the speed and accuracy of autofocus, exposure control, white balance, colour adjustment and other functions. It also boosts sensitivity to a maximum ISO 3200 for successful low-noise shots without flash indoors or in dim lighting conditions. Teamed with Super SteadyShot optical image stabilisation, this Double Anti-Blur solution ensures clearer handheld pictures, especially in low light or at higher zoom settings. The BIONZ processor also powers the D-Range Optimiser, adjusting exposure and contrast for natural-looking results, especially in strongly backlit scenes where there’s a risk of losing high- and lowlight detail. A new DRO Plus mode processes each image region separately for even more lifelike, balanced exposures with the trickiest scenes. Improved Face Detection technology can now distinguish automatically between children and adults, adjusting exposure, skin tone and red-eye reduction for great portraits with super-quick subject tracking. For even more fun when you’re shooting, Smile Shutter waits until the subject smiles before automatically firing the shutter. It’s great for capturing relaxed portraits and special moments with young children who won’t always smile on demand. Used in conjunction with Face Detection, it can be primed to fire the shutter when either a child or adult smiles. In a Cyber-shot first, the T300 now features Intelligent Scene Recognition that takes the guesswork out of selecting the right camera settings in a range of common shooting situations. In Advanced mode, the camera takes two shots – one with standard automatic settings and the other with optimised settings – allowing you to pick your favourite. Other standout features include the large, widescreen 3.5-inch Clear Photo LCD Plus touchscreen. With an extremely high resolution of 230k dots, it’s ideal for viewing your photos and showing them off to friends. There’s also a high quality Carl Zeiss Vario-Tessar lens with a powerful 5x zoom range that brings distant subjects closer with superb clarity. After shooting, the T300 makes it easy to keep track of your shots. New ‘Date View’ mode displays your shots as thumbnail images on an on-screen calendar, while ‘Favourites’ mode only displays shots that you’ve selected. In addition, ‘Filter by Faces’ automatically sorts pictures containing children, babies and smiles – great if you’ve got loads of portraits to sift through. Your memories will look even better in super-size as Slideshows with Music on your television set. Connecting the T300 to any PhotoTV HD compatible BRAVIA television or HD Ready display (via optional output adaptor cable) delivers even more incredible Full HD picture quality, with extraordinary detail and realism. Shooting in 16:9 high-resolution mode also makes it easy to create beautiful prints with the same widescreen aspect ratio as HD television. 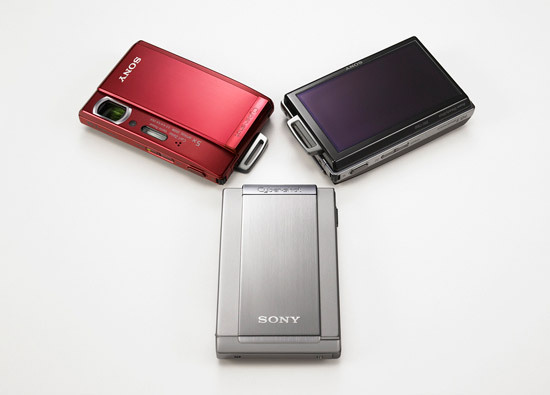 The Cyber-shot T300 will all be available throughout Europe from beginning March 2008.